L.A. council committee asks how festivals impact local economy. LOS ANGELES — Hoping to catch lightning in a bottle, two Los Angeles councilmen hope to repeat in 2015 the success of three events held earlier this year at the city’s waterfront in San Pedro. Councilmen Joe Buscaino and Mike Bonin seek to formally request the Los Angeles Harbor Department to provide a report to the Trade, Commerce and Tourism (TCT) Committee – which Buscaino and Bonin are members – of how events such as the Lobster Festival, Red Bull Rallycross and Tall Ships Festival L.A. impact the local economy. The councilmen’s motion, which was originally drafted in September before moving to the TCT Committee – also requested the report include perspective of how the Port of Los Angeles could attract more events similar to the Lobster or Tall Ships festivals. Both councilmen hope the Harbor Department will include information about the economic impact of this year’s events in its report in order to help city officials and local community organizations plan future events at the Los Angeles Waterfront. A report, however, might not be ready by the end of this year. Buscaino tabled discussion of the report request to a future committee meeting. The Port of Los Angeles hosted its 15th Annual Lobster Festival Sept. 12 through 14, about two weeks ahead of the official open of lobster season. Highlighting the three-day event were musical acts, food tastings and family-themed entertainment. 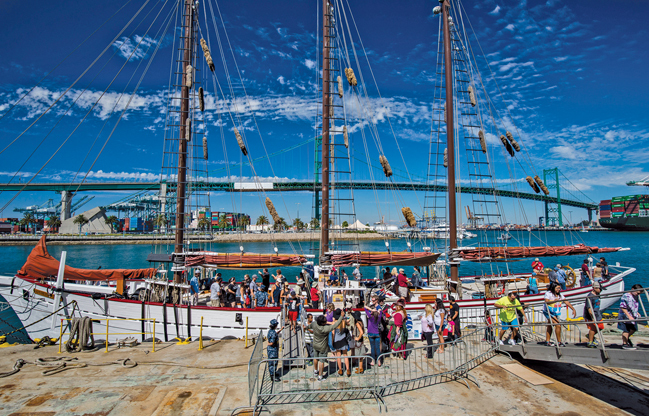 About one month earlier, the five-day Tall Ships Festival L.A. featured more than one dozen classic vessels on display. Similar to the Lobster Festival, Tall Ships Festival L.A. featured food trucks and wine tasting in addition to reenacted sword fights, canon demonstrations, vessel tours and sail training. In 2009, the Lobster Festival entered into the Guinness Book of World Records for “The Most Seafood Prepared by an Outdoor Event.” During a two-hour stretch during the 2009 event, 12,527 pounds and four ounces of seafood were prepared, more than three times the previous record. Craig Samborski, whose company organized Tall Ships Festival L.A., said the event was a financial boon for San Pedro. He added tall ships festivals have mass appeal and are ideal destination events for families. The city of Los Angeles has been trying for years to turn San Pedro and the harbor into a destination for locals and tourists. Some of the work already done at the area also known as the L.A. Waterfront included Cabrillo Way Marina, the Catalina Express Terminal, Ghost Fish art installation at San Pedro Slip and restoration of the Angels Gate Lighthouse. A youth sailing center in nearby Wilmington is also planned. “This is part of our overall strategy to bring people to the L.A. Waterfront. We want to be a world class destination,” said Cynthia Ruiz, the Port of Los Angeles’s deputy external director. Developing the area that includes San Pedro and Wilmington into a tourist destination is a significant economic benefit, she added. Looking back, the Lobster Festival in September drew about 40,000 guests, while an estimated crowd of 300,000 flocked to the L.A. Waterfront to attend the Tall Ships Festival, which happens once every three years. Ruiz added the economic benefit of the Tall Ships Festival alone was about $10 million, including $2 million worth of press for the Port of Los Angeles and $8 million to the local community. In addition to the Lobster and Tall Ships festivals, Ruiz said the L.A. Waterfront hosts an annual Navy Days event. A holiday boat parade is scheduled for Dec. 6. Still working to reach a critical mass of events, Ruiz said there are 20 acres of open space on the waterfront available for event use. Only about 25 percent of the space available throughout the entire L.A. Waterfront is actually being used as a destination for tourists and local visitors. The TCT Committee is comprised of three members: Bonin, Buscaino and chair Tom LaBonge. Buscaino represents the port and waterfront region on the city council.